A photo of Mount Whitney, the highest mountain in the Lower 48 at 14,505 feet, along with the Needles peeking out in a dip in the pass. 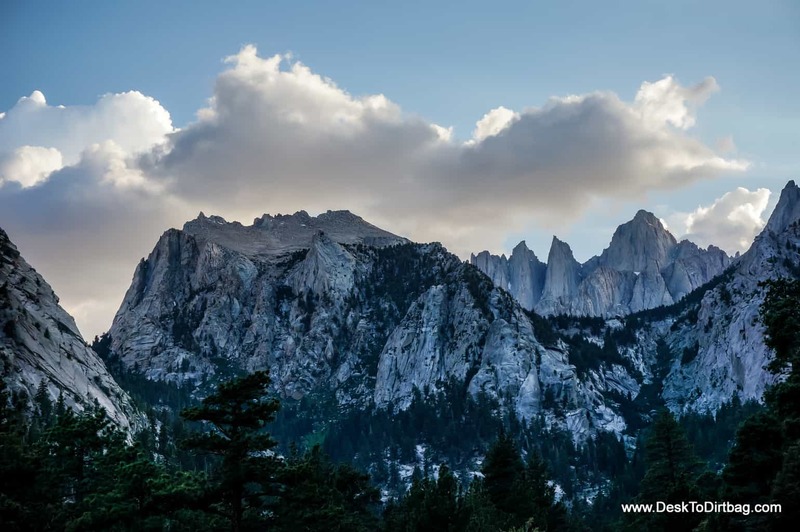 It’s an unmistakable and beautiful set of mountains that you must see while visiting Lone Pine, California. I had an amazing time climbing the East Buttress of Mount Whitney with my buddy Ryder at the Itinerant Climbers Collective. Check out this impressive video that he put together of our climb as well the details in my trip report right here on Desk to Dirtbag. I spent well over a month living in and around Lone Pine, California which sits at the bottom of the valley below the peak. It’s a quiet little town that is also pretty pricey (so stock up on food and provisions before you get there). The Alabama Hills is another spectacular place to explore and has been the setting for dozens upon dozens of Hollywood movies over the years. If you’re looking for something to do during a rest day, be sure to visit the film museum in town–it’s actually pretty interesting and worth the price of admission. Except for the week that I was sick with a cold (got it driving through Death Valley of all places), I really enjoyed my time in the area. The Lone Star Bistro is an awesome little coffee shop if you’re looking for good food, drink, and WiFi. Avoid Bonanza Mexican Restaurant like the plague–I don’t think I’d ever tasted bad Mexican food (it’s so easy, right?) until coming here… Twice (I gave them a second chance). The Whitney Portal Hostel and Store is the best (only?) place to grab a shower after a week or more of roughing in the High Sierras. Be sure to spend a night camping in the beautiful Alabama Hills, a jumbled mess of boulders set below the Sierra Nevada mountains. There is an interesting film museum in Lone Pine where you can explore the storied history and ties to Hollywood. Photo taken with my Sony-NEX6.